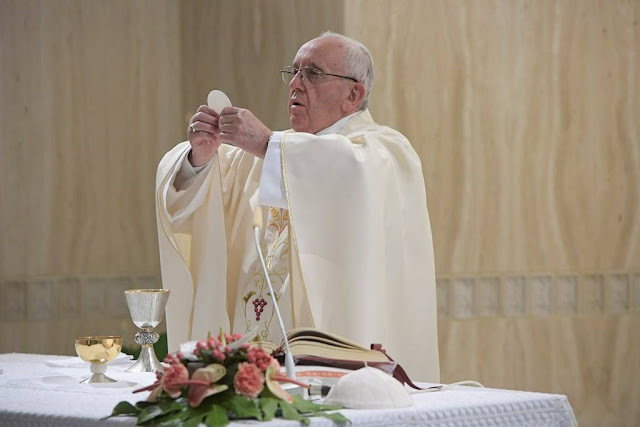 Pope Francis reflected on the virtue of patience in his homily during Mass at the Casa Santa Marta on Monday. “The testing of your faith produces patience”: Pope Francis based his homily for Monday’s morning Mass on this text from the First Reading, taken from the Letter of St James. But what does patience mean in life and in the face of trials? It’s certainly not easy to understand, the Pope said. Christian patience is neither “resignation” nor an attitude of “defeat,” he continued. Rather, it is a virtue of those who are “on the journey,” those who are moving forward, rather than stopping and becoming closed off. When you are on the journey, many things happen that are not always good. For me, the attitude of parents when a child is born sick or disabled says a lot about patience as a virtue on the journey. “But thank God that [our child] is alive!” [They might say.] These are people with patience. And they bear the life of that child with love, even to the end. And it is not easy care for a disabled or sick child year after year after year… but the joy of having that child gives them the strength to go forward. And this is patience, not resignation – that is, it is the virtue that comes when one is on the journey. Patience means “bearing with,” not entrusting problems to another, who bears the difficulty: “I bear it, this is my difficulty, my problem. Is something causing me suffering? Eh, certainly! But I bear it.” To bear with it. And patience is also the wisdom of being able to dialogue with the limits. There are many limits in life, but impatience doesn’t want them, it ignores them because it doesn’t know how to dialogue with limits. There is some kind of fantasy of omnipotence, or of laziness, we don’t know. But this patience St James speaks about is not simply a “counsel” for Christians, the Pope explained. “If we look at the history of salvation,” he said, “we can see the ‘patience of God, our Father,’ who has led and carried His ‘stubborn people’ forward each time they strayed one way or the other.” And the Father shows this patience, too, to each one of us, “accompanying us,” and “waiting” for the right time. God also sent His Son, that He might “enter into patience,” “taking up His mission,” and offering Himself decisively in His Passion. And yet they are determined to remain Christians: they have embrace patience just as the Lord embraced patience. With these ideas, perhaps, we can pray today, pray for our people: “Lord, give to your people patience to bear their trials.” And can also pray for ourselves. So often we are impatient: When things don’t go our way, we complain. But, step back for a moment, think about the patience of God the Father, embrace patience, as Jesus did. Patience is a beautiful virtue. Let us ask the Lord for it.